May never come together again. Sweet Chance, that led my steps abroad is the penultimate song from Songs of the Countryside (1926), setting poems of W H Davies (1871–1940). Here Head reacts to the poetical conceit of the simultaneous occurrence of a rainbow and a cuckoo’s song with music of pastoral serenity. No 6: Money, O! When I had money, money, O! Characterized by an emphatic rhythmic accompaniment and a vigorous tune, Money, O! 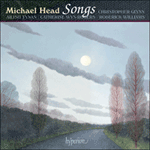 (1926) is the concluding song of Head’s W H Davies settings Songs of the Countryside.